Namely, improving the surface of my skin and glowing every single day! 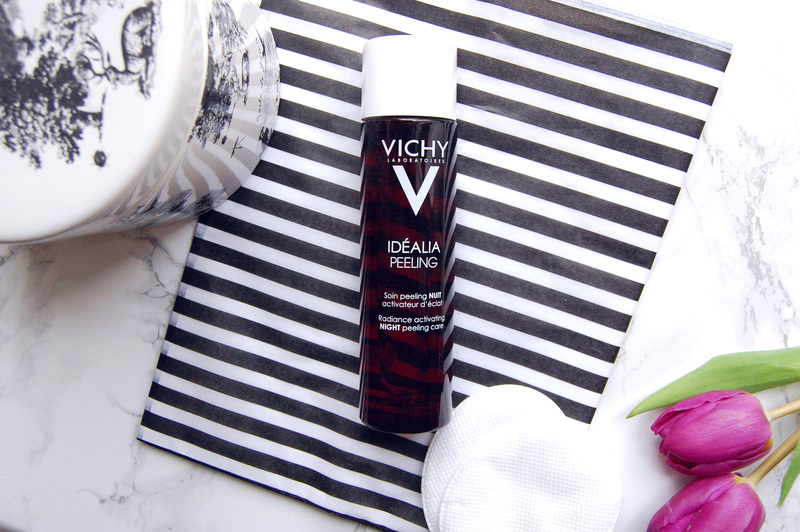 Enter Vichy Idealia Peeling. The concept of a peel treatment has always been scary to me. So if I’m going to dabble with acids, a formula that isn’t going to strip and sensitise my skin is a must. The beloved Pixi Glow Tonic is a treatment I’ve tried before, and although it works quite fine for me in spite of the witch hazel, I was curious about Vichy’s Idealia Peeling, which claims to be specifically designed for sensitive complexions. It’s formulated with 4% Glycolic Acid, and 5% HEPES, Hydroxyethylpiperazine Ethane Sulfonic Acid, which is meant to stabilise PH levels during chemical reactions. Or so Google tells me! Alongside these, antioxidant blueberry polyphenol and fermented black tea are the main ingredients. The concept of fermented ingredients being more potent for skin seems wishful thinking to me though. It’s the latest attempt of the beauty industry to incorporate Korean skin care principles in their products. On clean and dry skin, you apply a soaked cotton pad of this treatment and move on with your normal night-time routine, without rinsing. Contrary to what the name suggests, it doesn’t peel and more importantly, it’s not abrasive and doesn’t cause dry patches. For reference, I have an oily T-zone, and normal skin elsewhere, but I’m prone to dry flaky patches beside my lips if my skin is dehydrated. TMI? I can see a difference when I use this, and more so when I use it consistently. It doesn’t aggravate my skin, and the healthy glow it creates is very noticeable. Because of the exfoliation and cell turnover action, Vichy warns using a minimum SPF 15 is essential. But we should all be using SPF every day anyway, right? P.s. Escentual sells Vichy for less than FeelUnique and drugstores! I am glad you found a product that works for you! I have used Vichy products before but never this one! Thanks for sharing!